Any disease that affects less than 200,000 patients or 1 in 1500 is termed as a rare disease. There are around 5000 to 8000 rare disease reported, out which only 10% have cure. According to the European Organization for rare disease, 80% of rare diseases are genetic in nature. Some of the rare diseases include Alzheimer’s disease, Parkinson’s disease, Fabry disease, Gaucher disease, Pompe Disease and Hunter syndrome. Cancers are the most common category of rare diseases. Drugs are often “orphaned”, or never are produced and sold on the market, even when a compound is thought to be useful for the treatment of a rare disease. Developmental drivers such as government incentives, shorter development timelines and high rates of regulatory approval are making Orphan drug development as economically successful as non-orphan drug development, even though the patient pool is smaller. In one analysis, the average time from Phase II to launch was 3.9 years for Orphan drugs, compared with 5.4 years for non-orphan drugs. 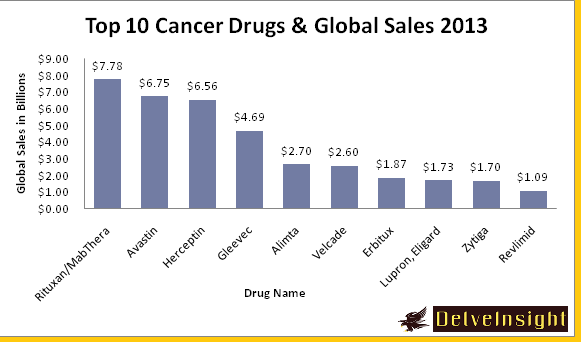 Orphan drugs also experience significant competitive advantage in being first to market. Recent research suggests that the higher pricing, increased market share, lower marketing costs, longer exclusivity period and faster uptake of Orphan drugs offset the smaller patient pool. There are positive developments in the area of Orphan drugs as well, including the formation of Orphan drug and rare disease institutes, grant programs and the passage of Orphan drug legislation by various countries. At the same time, it must be pointed out that the 300 Orphan drugs and devices approved in the last 25 years are a drop in the bucket compared to thousands of Orphan diseases that manifested in that same period. The drugs or treatments that brings in the largest amount of revenue is ranked highly and be of most importance, while developing treatments for rare diseases falls very low. Generally, bringing any drug into the market can be very costly and time consuming. The estimated cost of bringing a single drug through screening processes and FDA procedures to obtain approval is between $350 to $500 million. Clinical trials involving therapies for rare diseases are challenging for various reasons, including poorly understood disease processes, a lack of validated endpoints, difficulty with finding patient and logistical problems in clinical trial organization. Although these obstacles are not unique to Orphan drug trials, the solutions to these challenges may be more difficult to find. When designing a rare disease study, it is impossible to find fundamental disease information, such as disease prevalence, incidence or treatment patterns, on which to base the study protocol. In most rare diseases, there are no standardized clinical trial designs or efficacy outcome measures, leading to difficulty in selecting appropriate endpoints, outcome measures, tools and biomarkers. Recruitment for Orphan drug trials is challenged by the small number of patients for each disease, low disease awareness in the general population and an ill-defined base of treating physicians or clinics. A majority of rare diseases affect children and pediatric studies require sponsors to carefully balance the ethical considerations of conducting studies in a vulnerable population with concerns about site selection, recruitment, compliance, and statistical powering. According to global market estimation there are 600+ drugs in clinical phase and 280+ drugs in market. Only in US there are around 350+ Orphan drugs, which are under clinical phase. Novartis will maintain its position as the world’s No. 1 Orphan drug company in 2018. Kyprolis, a drug from Onyx Pharmaceuticals for multiple myeloma, was the most promising new Orphan drug in 2012. Orphan market exclusivity, because it is limited to the approved indication, has a value that is in part determined by the Orphan drug’s competitive environment. For example, if the same drug, in the same dose and dosage form is available generically, the competing generic may be prescribed and substituted off-label for the drug that has obtained Orphan approval. This substitution is likely to significantly decrease the Orphan drug’s market share. The US Food and Drug Administration (FDA) and the European Medicines Agency (EMA) have announced a more streamlined process to help regulators better identity and share information throughout the development process of Orphan drug and biologic products, which are developed specifically to treat rare medical conditions. A country should try to produce important drugs for the benefit of the whole world, depending on the research and development investment, the return on such investment, the tax and patent incentives, and its regulatory policies. Australia, Japan, Singapore, Taiwan, and Korea have already implemented legislation for promoting research on Orphan drugs: India and New Zealand are in the process of establishing similar regulatory processes. Improved scientific understanding of rare diseases is transforming the biopharmaceutical industry approach to drug therapy. Increased industry focus on the development of targeted therapies, and the trend toward stratified or personalized medicine has been central to the development of many Orphan drugs, as approximately 80 percent of rare diseases are related to genetic aberrations. It has been suggested that targeting these genetic defects leads to a higher likelihood of R&D success. As a result, Orphan drug development shows great potential for commercialization and is an important part of the future of the global biopharmaceutical industry. In order to capitalize on the opportunity in rare diseases, sponsors must learn to navigate the regulatory and operational challenges of Orphan drug development, with the ultimate goal of serving an unmet need for millions of patients around the world. We are a Business Consultant company and serve as a Knowledge partner across the value chain of Pharmaceutical Industry. We made strong presence in Orphan market, with 200+ Reports on Orphan based Indications, 100+ Reports on Oncology based Indications & Mechanism of Action (MOA), 70+ Reports on CVS Indications, 60+ Reports on CNS Indications and 15+ Reports on Specialized Gene Therapy. Our custom Reports can provide assessment over Market size & forecast, epidemiology, advancement in technologies, market trend, partnering & licensing opportunities, pipeline scenario and competitive landscape. We also deal custom research services in coherence with interest area of the clients. DelveInsight is a leading Business Consulting and Market Research Firm. We help our clients to find answers relevant to their business, facilitating decision-making; identify potential market opportunities, competitor assessments and business environmental assessment. In addition to this, DelveInsight also deals in providing custom research services in coherence with interest area of the clients. This entry was posted in Rising of Orphan Drug Development and tagged Alzheimer’s disease, biologic products, children, Clinical trials, DelveInsight, disease prevalence, Gaucher disease, genetic defects, Hunter syndrome, incidence, Multiple Myeloma, Novartis, Onyx Pharmaceuticals, Orphan, Orphan market, Pompe Disease, Rare Disease, targeted therapies, treatment patterns, US Food and Drug Administration. 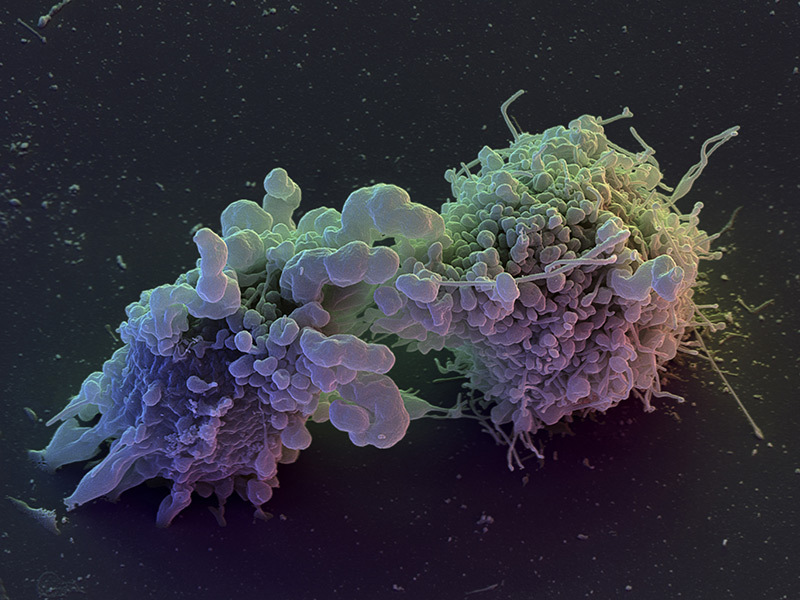 In the field of oncology, no other approach is as attentive as Immunotherapy. Renewed interest in immunotherapy has been driven by Chimeric Antigen Receptor (CAR) T-cell therapy. This emerging approach is (CAR) T-cell technology which is showing great promise in immunotherapy. There are 35+ products in pipeline and 40+ companies are active in this field. 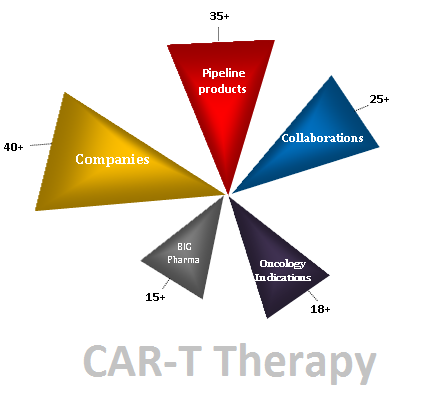 With the advancement of (CAR) T-cell technology showing more safety and efficacy, the companies dealing with immunotherapy are grabbing the opportunity to enter in this new emerging market by the routes of collaborations and acquisitions. What is CAR-T Cell Therapy? CAR T-cells are the engineered T-cells to express chimeric antigen receptor (CARs) which identifies specific antigens of a target-cell. CARs are specifically designed receptors, which graft specificity into an immune effector cell. This therapy acts as genetic modification of T-cells from cancer patients by gene transfer of chimeric antigen receptors (CARs) to recognize molecules on cancer cells without relying on MHC presentation. This adoptive T-cell therapy harnesses the power of the immune system to target and kill tumor cells. Most of the companies are dealing with the conventional CAR T-cell technology, targeting CD19 antigen of lymphoma cells, which is occupying more than 50% share in target antigens. Meanwhile, the companies are also investing on the studies targeting 25+ different antigens of cancer cells as well as the firms are coming up with 8+ different technologies to enhance the safety and efficacy of the CAR T-cell therapy. There are 35+ pipeline products and 40+ companies’ including small and big firms are actively involved. Out of 40 companies, 15+ leading companies are involved with their product in clinical phases. 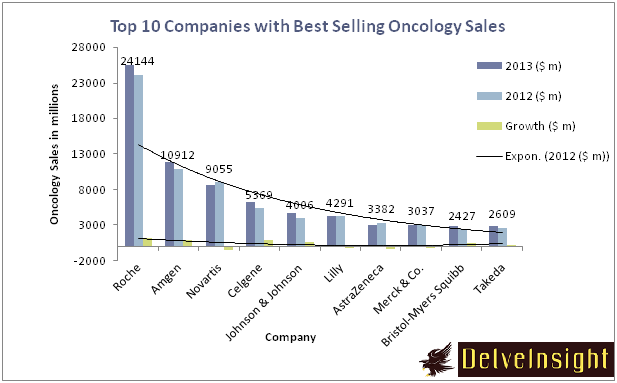 Novartis with the Phase-II product CTL019 is leading the race. With 25+ collaborations happened in recent years, Juno Therapeutics (JUNO) has inked a massive $727 million R&D deal with Editas Medicine that is considered as greatest deal in this segment. 7+ Research institutes and 12+ small firms having core CAR T-cell technologies partnered with some of the leading companies for the development of the CAR-T cell therapy. As CAR-T technology are showing most promising results in cancer studies, companies are conducting their Pre-clinical and clinical trial studies with 18+ Oncology indications, in which B-cell malignancies, Lymphoma & Leukemia are the prominent one. CAR T-cell therapy will drive the future of Immunotherapy to promising heights. The companies with lagging attention to this approach are already behind. The deals will continue to increase the market size and continued desperation to get on surviving with the key risks on this competitive landscape, numerous players could end up basking in reflected glory. This entry was posted in Chimeric Antigen Receptor (CAR) T-cell Therapy and tagged CAR-T Therapy Landscape, CD19 antigen, Chimeric Antigen Receptor (CAR) T-cell Therapy, clinical trial, collaborations, Immunotherapy, Novartis, Oncology, Partnerships, Pipeline, Pre-clinical. Stem cells (SCs) have been an excitement area of medical research since 1800s. In the mid 1800s it was discovered that cells were basically the building blocks of life and that some cells had the ability to produce other cells and in 1900 scientists had discovered that some cells had the ability to generate blood cells. In 1968, first successful bone marrow transplantation was performed to successfully treat two siblings with severe combined immunodeficiency. Since 1968, stem cell research has progressed dramatically and every year, companies are increasing for stem cells research. A human body is made of more than 200 different types of specialized cells like muscle cells, fat cells, skin cells all originating from stem cells. A stem is a un-specialized immortal cell which on differentiation performs a specific function but can no longer become another type of cell. Broadly stem cells are divided into adult stem cells/tissue specific stem cells and pleuripotent stem cells. 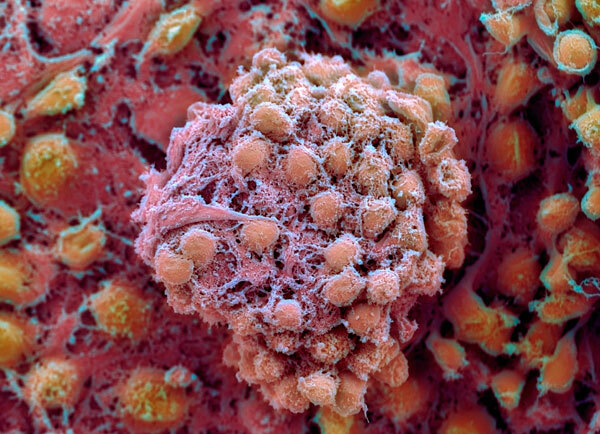 Different types of stem cells have different levels of potential. In cellular therapeutics stem cell therapy has emerged out as key driver for the purpose of regenerative and restorative medicine globally across a number of diseases. There are presently more than 200 plus companies working in stem cell therapy products globally. Adult stem cells are perhaps the most attractive source stem cells with more than 70% followed by embryonic stem cells, cord blood cells and fetal stem cells across all biopharmaceutical industry. Mesenchymal stem cells from bone marrow and hematopoietic stem cells have been widely used in four decades with lot of medical research done in neurodegenerative diseases using neural stem cells. Some of the major therapeutic areas addressed in this era mostly revolve in cardiovascular diseases, central nervous sytem (CNS) diseases, Hematopoietic diseases, orthopadic and diabetic diseases. Many companies have started research using induced pleuripotent cells which may show pleuripotency and their proliferation may also vary. Two of the leading companies are iPierian, Inc. which is now acquired by Bristol Myers Squibb Company and Fate Therapeutics exploiting the iPS technology. In past two years, the global market for iPSCs have grown immensly crossing $ 1 billion. Recently parthenogenesis emerged as new class of obtaining stem cells where embryo is created solely from female oocyte without genetic contribution from male. International Stem Cell Corporation is one such company which has poineered in new class. It avoids the ethical issues as well as show immune matching to patient which is most important in case of transplantation. Moreover, stem cell therapy is getting huge attention from big pharmaceutical companies. The potentials of stem cells have clearly overcrossed the drawback and major pharmaceutical players like Novartis, Johnson & Johnson and Celgene Corporation have invested in stem cell reaserch. Novartis expanded its stem cell research by investing in Gamida Cell and Regenerex stem cell technology. Similarly J&J has invested in Capricor Therapeutics and Viacyte for cardiovascular and diabetic diseases. 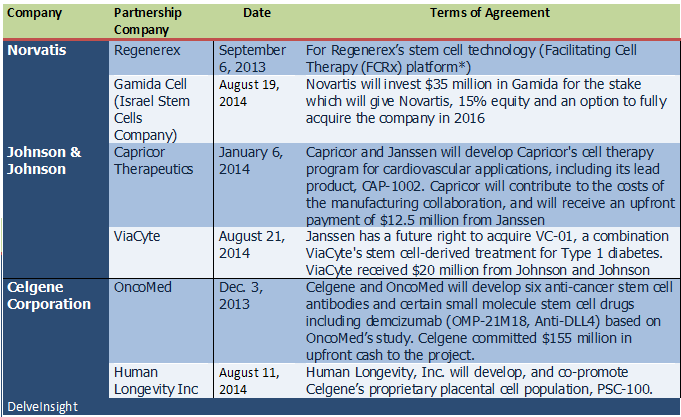 Recently Celgene entered into agreement and invested in Oncomed and Human Longevity Inc. This entry was posted in Specialized Reports and tagged Celgene Corporation, iPSCs, Johnson & Johnson, Mesenchymal stem cells, Novartis, Stem Cell therapy.